I should be working right now. I'm already behind on lesson planning this week and I have an open class tomorrow. But I can't ignore the ache in my heart. If you don't know, I'm from Boston. At least, that's what I tell everybody here. 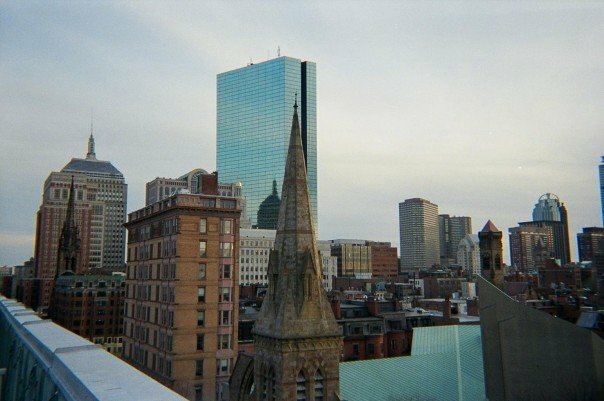 I grew up in a small town in Montana, but I went to college in Boston. While I was there, my family moved away. Now, we're scattered across the country. My point is, Boston is the closest thing I have to a hometown. Boston is where I saw a world beyond my small Montana upbringing. Boston took me in, taught me about life, and molded me into the person I am today. Montana may have raised me, but I grew up in Boston. I woke up yesterday (Monday) morning with an ache in my heart, wishing I could be back at home for Boston's biggest holiday. Sure, Christmas is important, and Saint Patrick's Day is legendary, but you can get those anywhere. Nothing quite compares to Marathon Monday. It's a holiday all our own. On Patriots Day, the day of the Boston Marathon, the whole city shuts down. We line the streets to watch some of the finest athletes in the world fly by along with thousands of runners who are chasing their dream of completing this iconic race. The faces at the finish line are those of people in the midst of one of the highest moments of their lives. It hurt me to have to miss it. Today, I woke up with a different heartache. I woke up to find out that the joy of Marathon Monday had been shattered. After frantically scouring Facebook to make sure my loved ones were accounted for, I turned on the news. As you may have gathered from a few posts back, I have a personal relationship with Boston news. I immediately found the live stream for my old station. Obviously I wanted to find out what had happened, but mostly, I just needed familiarity. I wanted to see the faces of my friends and hear their voices and reassure myself that they were ok. That they were alive. I have never felt quite so far away from home. As I continued looking for information, I went to CNN's homepage. Right underneath the bombing was an alert that North Korea has said something provocative and threatening about Seoul... again. My heart sank even lower as I allowed myself to feel the fear that I've been keeping out for the last few weeks. I allowed myself to acknowledge that the world is, in fact, a terrifying place. There is so much hatred. "Why?" I asked myself. Why do we hate each other so vehemently? Why do we insist on inflicting the same harm that has been inflicted on us? Deep down, we're all the same. We all have the same fears, the same hopes, the same loves. We all care about our family and want to be happy. We all worry about the same little things. Why, then, does humanity insist on killing itself? I saw many posts on Facebook and Twitter about finding the person or group responsible for today's tragedy and exacting violent, painful revenge. But will that help? Will that heal the hurt in our hearts? If a broken limb is set incorrectly, it heals crookedly. A broken heart healed by retaliation won't heal properly either. But how is there any way, any possible chance of ever stopping this cycle of violence? Then I thought about the people who rushed in to help. Within seconds, without a second thought, they ran towards the danger to help those in need. Can you imagine that? Running towards carnage, towards your own potential death without hesitation? I thought about the marathon runners who crossed the finish line and just kept running right up to the hospital, offering to donate blood. So many people rushed to give blood that local hospitals had to turn them away. It helped me remember that as much hate as there is in the world, there is more love. There are many whose hearts are full of malice and violence, but there are more whose hearts hold kindness and compassion. We can't let our desire for revenge consume us. We have to rise above. We can't let ourselves succumb to the fear and the hatred that permeates the world. There's more good than bad. But we have to keep believing in it.